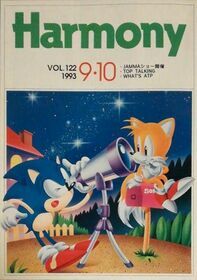 Harmony (ハーモニー) was an official magazine/newsletter distributed internally to Sega employees in Japan. It was not distributed regularly - sometimes the gap between an issue was a month, other times two months, presumably depending on what the company was doing at the time. Little is known about Harmony, however a situation arose where many pieces of cover artwork, created internally at Sega specifically for this magazine, made their way into Sonic Jam and later Sonic the Hedgehog The Screen Saver. It is thought the magazine began at some point in the late 1960s / early 1970sMore... and ended in 1998.